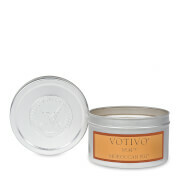 Natural soy blend wax candle in a convienent travel tin. 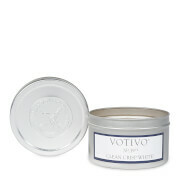 Take the Votivo mystique with you.This candle has the scent of ripe, juicy grapefruit. Take a second, show your funiture some love, and place your candle's lid underneath the tin before burning. Your furniture will thank you later. Keep wick trimmed to 1/4" at all times. Keep completely out of drafts. Burn at least 2 hours then allow to cool before re-lighting. Extinguish and discard candle when only 1/4" wax remains. Keep foreign matter and wick trimmings out of candle to prevent fire. Do not leave a burning candle unattended. Keep out of reach of chldrena dn pets. Never leave a candle on or near anything that can catch fire. Tin can become hot and damage surface if lid is not placed below candle while burning.